Data from the Bureau of Labor Statistics on construction industry inflation show that contractors have begun to fully register and pass on the higher costs of building. 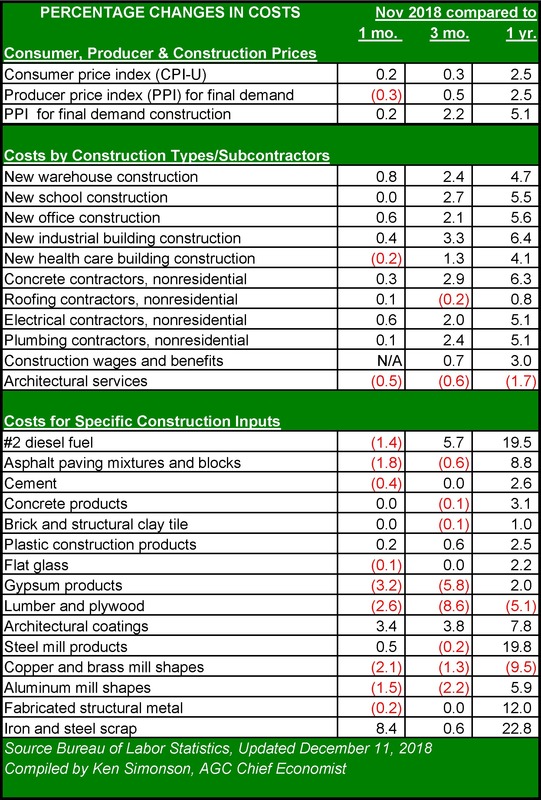 Heretofore, the inflation of material costs and inputs to construction, which jumped to three times the rate of overall the producer price index (PPI) in May, had not appeared in the PPI for individual building types. Likewise, the more accelerated increase in construction wages – about 30 percent faster than inflation in all wages – had primarily been absorbed by contractors. These trends change significantly in the fourth quarter of 2018, as the PPI for specialty contractors jumped to as high as 6.1 percent higher year-over-year. Contractors’ associations, like the Associated General Contractors (AGC), had voiced concerns that project costs were creating a squeeze on contractors as input prices rose in recent months. The change in trend suggests that construction companies are factoring the higher inputs into their construction put in place. Given the lead/lag relationship between construction pricing and contracting, and construction put in place, it’s likely that contractors had begun passing on the higher pricing when the announcements of tariffs spiked inflation in May 2018. Another indicator of this adoption of higher pricing is the narrowing of the gap between the PPI for construction goods and the PPI for the major construction categories. PPI for construction goods continued to rise towards eight percent in the fall, after moderating closer to six percent in July and August. The PPI for residential, non-residential and all construction industries moved higher and varied between 6.4 and 6.6 percent. Several workforce data providers reported estimates for the year-over-year increases in wages for the construction industry. PAS, Inc. reported in its Contractor Compensation Quarterly that hourly wages would increase 3.2 percent in 2018 – a slight decline from the 3.4 percent increase in 2107 – among the contractors it surveyed. WorldatWork projects slightly higher increases, an average of 3.6 percent for nonexempt hourly workers. These estimates are consistent with the BLS reports throughout the year, which pegged construction wages at roughly half a point higher that the averages wages for all hourly workers. Wages and benefits that are rising add to the inflated cost of construction, but the more significant upward force may be the decline in productivity that is the result of the nationwide construction workforce shortage. As of October, 227,000 construction jobs remained unfilled. Data on the inflation of materials and building products also showed persistent year-over-year increases. IHS Markit and the Procurement Executives Group (PEG) reported that its indexes rose for the 23rd straight month in November, with prices rising in 11 of the 12 subcomponents of the procurement index. Rider Levett Bucknall reported on November 2 that its Comparative Cost Index rose 4.7 percent from July 2018 to July 2018. The Federal Highway Administration reported that the National Highway Construction Cost Index increased 4.4 percent in June from March and 3.8 percent from June 2017. Both increases were accelerations from the previous quarter and year. The data in the December 11 Producer Price Index report from the BLS saw prices edge lower in November from October, aided primarily by a near double-digit drop in energy costs. Steep declines in the price of fuel lead energy costs lower from month to month. Year-over change in PPI for diesel fuel fell from 27 percent higher in October to 19.5 percent higher in November, with the price dropping 1.4 percent in the month. Change in PPI for inputs of all goods for construction fell from 7.9 percent in October to 5.3 percent in November. No other major category of inputs experienced increases of more than two or three percent in November. This provides some level of hope that the tariff-driven price spikes from mid-year have leveled off. With global demand softening for many construction materials, upward pressure on inputs should abate in 2019. The expiration of the 90-day “truce” called between U.S. and China tariff increases will mark the next potential turning point for building products and materials.